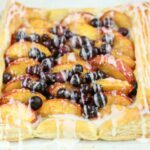 Puff Pastry Blueberry Peach Tart on puff pastry with a vanilla icing is perfect for a quick dessert, breakfast, or brunch. Sometimes you are looking for a quick dessert. Which is why we love this quick and easy dessert! I try and keep a few boxes of puff pastry in the freezer at all times, so when the mood strikes, we’re ready! 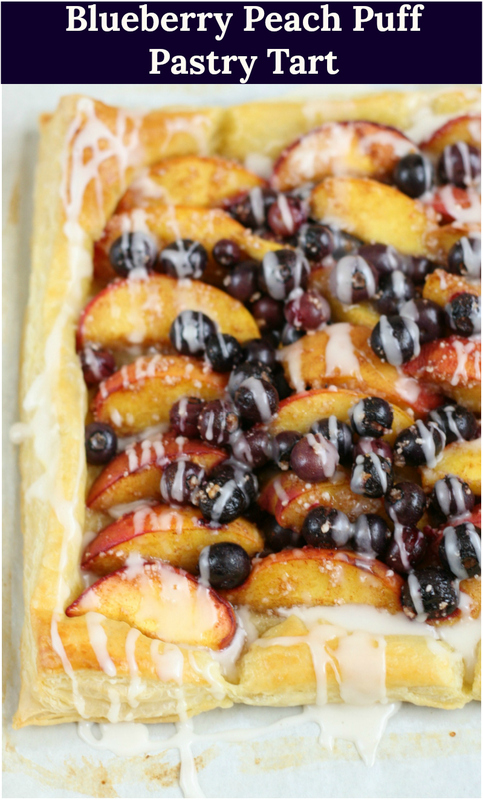 This puff pastry tart is simple to make with any fruit, but for this particular one I chose blueberries and peaches because they do so well together. I also try and stock the freezer with fruit when it’s in season or on sale. Just place fresh fruit into freezer type Ziploc bags and plop in the freezer. Then take out when you need. Step 1: Remove the pastry sheets from the freezer and thaw for about 15 minutes at room temperature. Or until they can be easily unfolded without cracking. Step 2: Preheat the oven to 400 degrees F. Line 2 half sheet pans with parchment paper, set aside. Step 3: Place peach slices and blueberries in a small bowl. Toss them with sugar, cinnamon, tapioca, and lemon juice. Set aside. Step 4: Gently unfold each pastry onto the prepared baking pans. 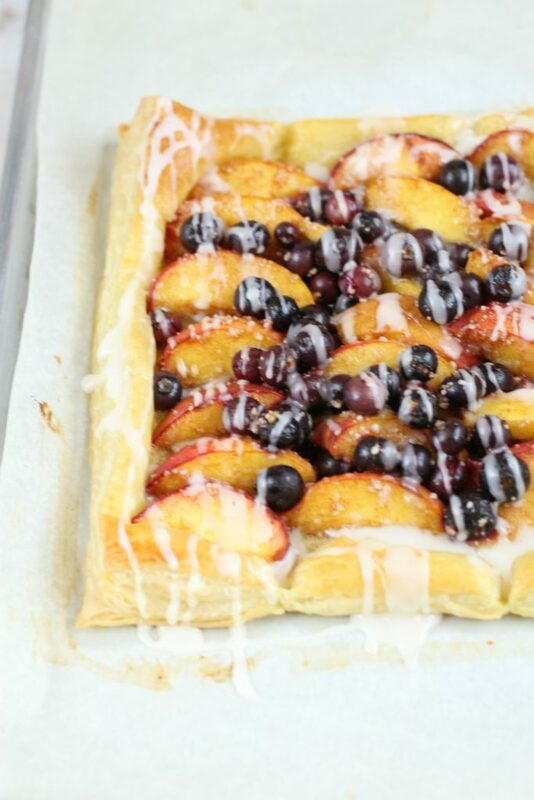 Layer peach slices evenly on each puffed pastry, making 3 neat rows on each pastry. Leave about a 1 to 1 1/2-inch border around the pastry. Spoon blueberries over peaches. Step 5: Brush the edges of puff pastry with egg wash and bake in the preheated oven for 18-20 minutes, or until golden brown and the fruit softened. Turn your baking pans part way through cooking. 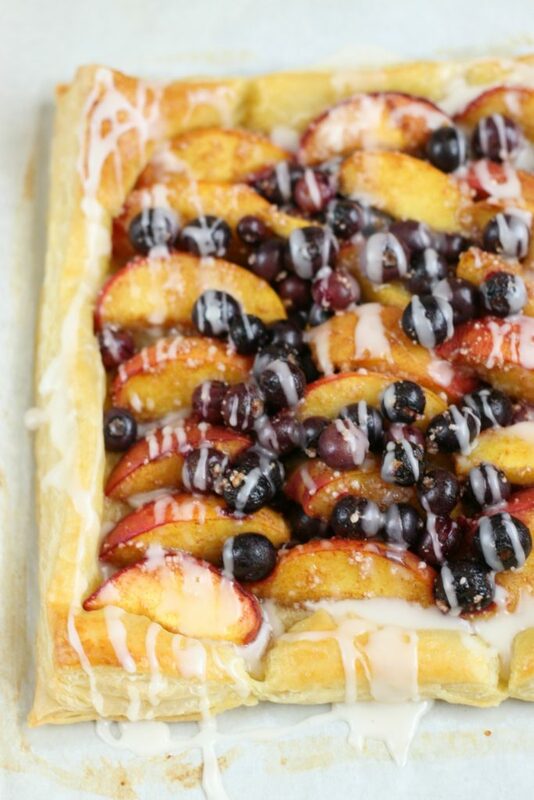 Puff pastry is really so versatile. You can even cut it into small squares and place it in a muffin tin and use for small quiches. If you haven’t already, don’t forget to order yourself half sheet pans and parchment sheets that fit that pan! They are so much easier than the roll of parchment paper! 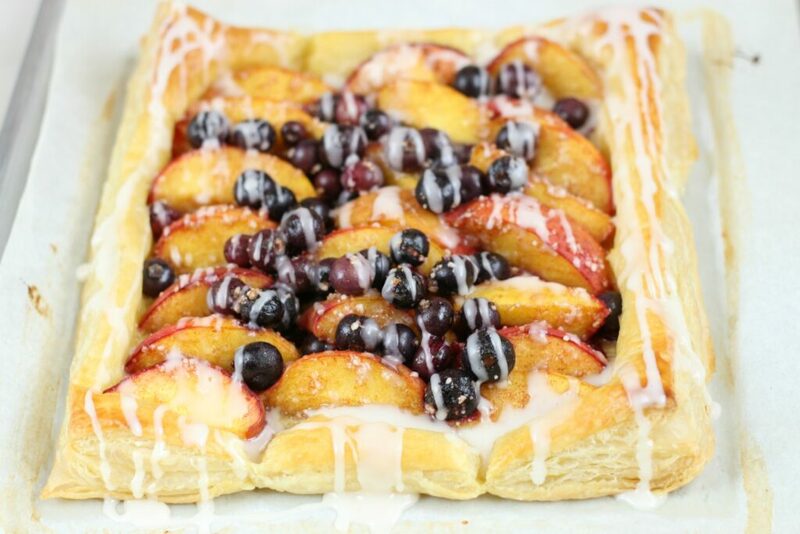 Blueberry Peach Puff Pastry Tart is a quick and easy dessert made with frozen puff pastry and fresh fruit. Remove the pastry sheets from the freezer and thaw for about 15 minutes at room temperature. Or until they can be easily unfolded without cracking. Line 2 half sheet pans with parchment paper, set aside. 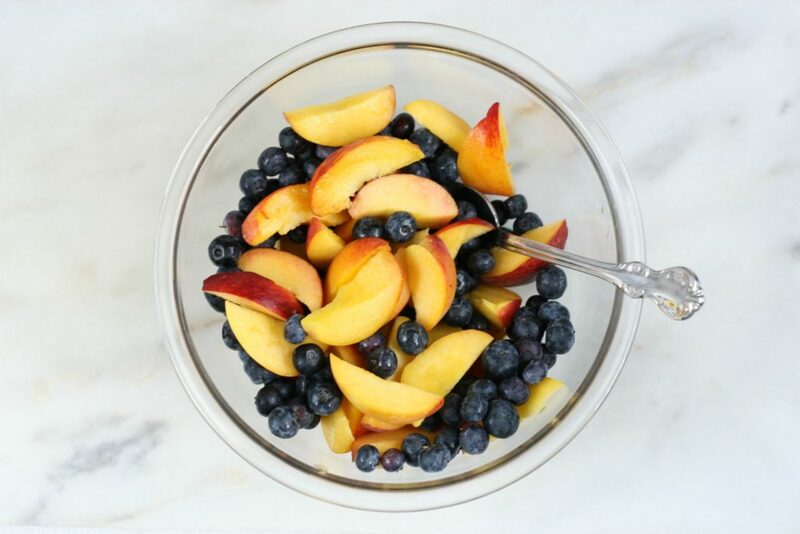 Place peach slices and blueberries in a small bowl. Toss them with sugar, cinnamon, tapioca, and lemon juice. Set aside. Gently unfold each pastry onto the prepared baking pans. 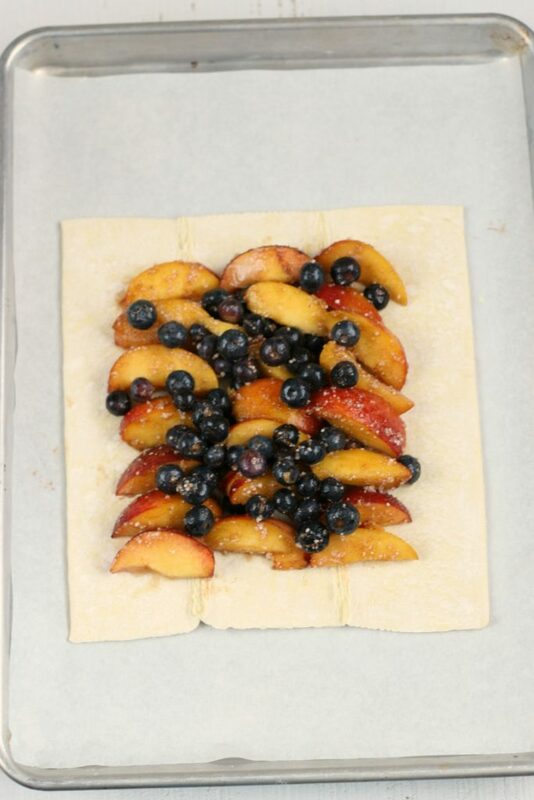 Layer peach slices evenly on each puffed pastry, making 3 neat rows on each pastry. Leave about a 1 to 1 1/2-inch border around the pastry. Spoon blueberries over peaches. Brush the edges of puff pastry with egg wash and bake in the preheated oven for 18-20 minutes, or until golden brown and the fruit softened. Turn your baking pans part way through cooking. While the pastry cooks, whisk together the ingredients for the icing. Add more or less milk to achieve your desired consistency. Drizzle over the tart before serving. Serve with vanilla ice cream if desired. I am taking this to your family Easter brunch, it is beautiful and so festive! I’m so glad you’re going to make this one. You can really use whatever fruit you love.